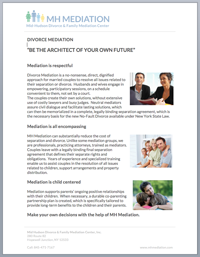 The process of solving problems and disputes at MH Mediation has been carefully designed and proven over time to achieve the most satisfactory results with a minimum of upset and acrimony on all sides. Whatever the dispute involved, the following is a general outline as to how the process unfolds. The mediation process begins with a one hour consultation between the mediator and the parties involved. This initial meeting is designed to be exclusively informational, during which the process is explained in detail and ample opportunity is provided for questions to be answered and concerns to be addressed. Historically, the meeting has enabled people to make an informed decision whether the process is consistent with their expectations; whether mediation is the right choice for them; whether they feel comfortable with the particular mediator. If both sides decide they want to participate in the mediation process, they can schedule an appointment for their first mediation session. The schedule of appointments varies depending on the needs of the participants and mediators. Our mediators strive to be as flexible as possible in regard to scheduling. Sessions ordinarily occur on a weekly or bi-weekly basis, at days and times agreeable to all. Each session is ordinarily one hour or one and a half hours in length. How long or short the overall process takes is entirely in the hands of the participants. Our lawyer-mediators resolve many different kinds of disputes including divorce and separation, prenuptial agreements, family disputes, and conflict resolution in business and other civil disputes. Discussion must be preceded by the provision of relevant information, without which meaningful dialogue cannot occur. Full and honest disclosure of assets and liabilities, income and expenses is required. This is critically necessary as the basis for an informed, legally binding and enforceable agreement. Generally the process begins with identification of issues, exploration of all of the relevant facts, examination of individual interests and concerns, and then proceeds to problem solving and negotiations. Over 90% of the couples who have undertaken mediation with us and have stayed with the process successfully resolve all outstanding issues.